Methodology to control functional molecules by macroscopic mechanical motion such as conventional hand motions will be established. Coupling of macroscopic motions and molecular functions can be accomplished at low-dimensional interface. At asymmetric low-dimensional system such as molecular films, macroscopic lateral motions can be directly used for controlling molecules. 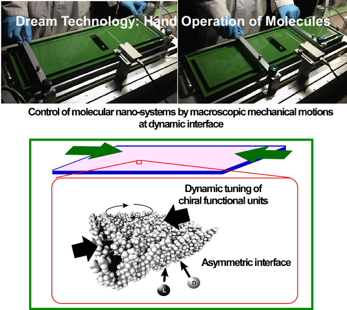 Molecular machines at such interfaces can freely operated through lateral film deformation in tens of centimeters, possibly resulting in chiral control of interfacial phenomena. These research will be done with appropriate dynamic two-dimensional interfaces, Langmuir monolayers at the air-water interface. Two-dimensional linkage of functional molecular systems through coordination will lead to development of rational transfer of mechanical stimuli to molecular motions.